Personalize our Posh Mommy� Mini Dog Tag pendant with gemstone with engraving options available on both back and front and with your choice of genuine gemstone or diamond. Also available in 14k white or yellow gold (shown below). * Necklace contains 1 pendant. Add more pendants now or in the future for a multi dog tag pendant necklace. 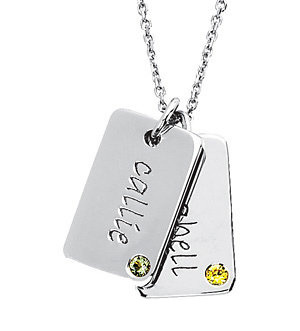 See our collection of quality personalized silver jewelry. Front & back can be engraved with 8 characters max. Pendant measures approx. 5/8" tall x just over 3/8" wide (16mm x 10mm). We guarantee our Posh Mommy Engravable Mini Dog Tag Pendant, Sterling Silver to be high quality, authentic jewelry, as described above.